To start Sunday's playoff action, the Bengals were looking to get a win in Indy and win the big one while Andrew Luck had something to say about that. The Indianapolis crowd were hot after a great start from the Colts. They had a 9 play, 71 yard drive that lasted for 3:55 and was capped off with a Herron 2 yard TD. Dalton and his Bengals punted after that and the Colts went 3 and out after that. To end the first quarter, the Bengals answered back with a TD of their own. Hill ran up the middle for a one yard TD & we were tied at 7. The Colts then put up three points after a Vinateri field goal. Cincinnati's offense wasn't clicking, they went 3 and out and then the Colts put up another 3 points and took a 13-7 lead. 5 plays later, the Bengals found themselves punting again. The Colts looked like they were going to score on this next drive after a 17 yard catch and run by Herron, but he fumbles and Cincinnati recovers! A big turnover that changed the momentum and field position for the Bengals. 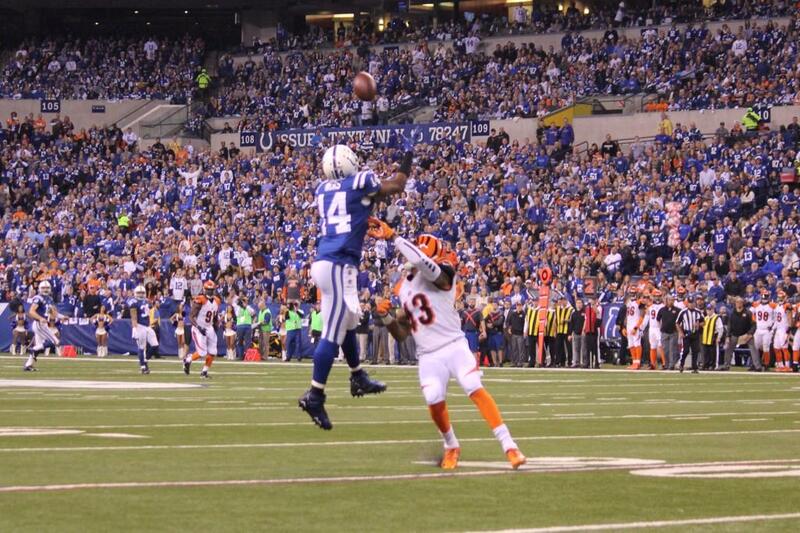 The Bengals would then capitalize after a Nugent 57 yard FG to end the half, Colts lead 13-10. We come back to the second half and the Bengals went three and out and so did the Colts right after that. The Colts defense made another huge stop that got them the ball back with good field position. On a second and ten, Luck scrambled out of the pocket and had two guys trailing him as he threw a 36 yard bomb on the run and Moncrief caught it for the TD! The Colts lead 20-10. The Bengals again couldn't move the ball past half field as they punted away to the Colts. The Colts had a TD but it was called back because of a penalty, they ended up getting 3 points to end the drive. And again the Colts defense denied Cincinnati to pass half field and they forced another 3 and out to end the 4th! 23-10 Colts after 3. Indy scored another 3 points and that put them up by 16. The Bengals offense is just awful as they went 3 and out & punted again. The Colts took time off the clock and punted back to the Bengals. Dalton finally found his rhythm but that got cut off after he got sacked from behind and the ball came out. Indianapolis had good field position but melted the clock and the Bengals got the ball back with no timeouts and 59 seconds to work with. The final score, Colts 26-17 Bengals. Andrew Luck played phenomenal. He threw for 376 yards and a TD. He only had 13 incompletions and a passer rating of 104. Adam Vinatieri scored 14 points all by himself and bad more than the Bengals team as a whole. He kicked 4 field goals and the two extra points. The Colts defense stepped up and they played outstanding. They forced one turnover and made the Bengals punt 8 times! In the second half, the Bengals punted 5 times, fumbled once, and drove down the field on their last possession but the game came to a close so they couldn't score. The Colts travel to the Broncos next Sunday to play them in the divisional round.